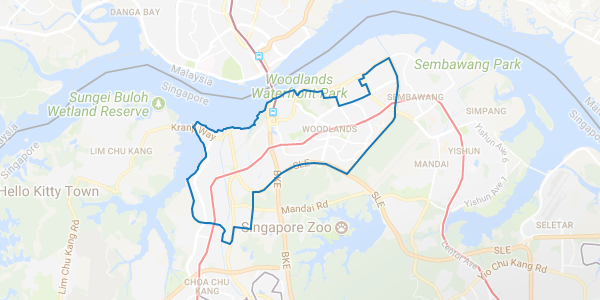 District 25 comprises Woodlands, Admiralty and Kranji, located in the north region of Singapore. Although the area is predominantly residential, a large area in Woodlands and Admiralty is designated for industrial use. The area is served by the Woodlands, Admiralty and Kranji MRT stations of the North-South Line. Woodlands will be connected via upcoming Thomson-East Coast Line by Woodlands, Woodlands North and Woodlands South MRT stations, which are expected to be completed in 2019. Woodlands station will become an interchange station, connecting North-South Line and Thomson-East Coast Line. Woodlands is earmarked to be a new growth area in Singapore. Woodlands Regional Centre will comprise of two distinctive districts — Woodlands Central and Woodlands North Coast. There will be a host of commercial and mixed-use developments in these areas. Once fully developed, Woodlands Regional Centre will have approximately 700,000 square metres of commercial space, offering about 100,000 new jobs, according to Urban Redevelopment Authority. A notable landmark in this district is the Singapore Racecourse in Kranji, which was opened in 2000 as a replacement for the Bukit Timah Race Course. Causeway Point is the most notable mall in district 25, offering a variety of shopping and dining options. Located in the heart of Woodlands Regional Centre, next to the Woodlands MRT Station and bus interchange, it is one of the largest suburban shopping malls in Singapore. Schools in the vicinity include Woodlands Primary School, Innova Primary School, Republic Polytechnic and Singapore American School. Major projects in the district include Casablanca, Parc Rosewood and Rosewood.